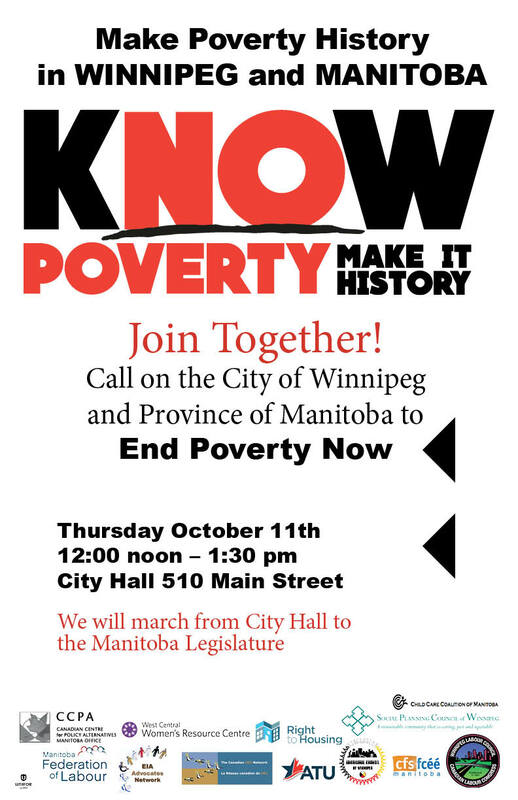 Make Poverty History Manitoba, along with community organizations, members, and people with lived experience of poverty, will be hosting a rally and march on Thursday, October 11th. We are calling on both levels of government, municipal and provincial, to take serious action NOW to end poverty. Details: At 12:25, we will march from City Hall to the Manitoba Legislature, where will attend Question Period at 1:30pm. -Adoption of Municipal AND Provincial Comprehensive Poverty Reduction Strategies. According to polling by Probe Research in Spring 2018, we know Manitobans support action from our government for poverty reduction. On October 11, we will demonstrate to candidates in the municipal election and provincial MLAs that we need meaningful action now. Up to 107,000 Winnipeggers live in poverty. Some 39,000 more across Manitoba are living in poverty. Across the entire province, we know that crime, addictions, poor health and social conditions, and other social issues stem from ongoing poverty in our communities. We need the Province of Manitoba to release their poverty reduction plan, now a year and a half overdue, in violation of provincial legislation. We have also released a blueprint for a provincial plan, The View from Here: Manitobans call for a renewed poverty reduction plan. A priority must be overhauling Employment and Income Assistance (EIA) to create a Livable Basic Needs Benefit, detailed at knowpoverty.ca. This entry was posted in Event and tagged #mbpoli, community rally, rally, winnipeg without poverty. Bookmark the permalink.